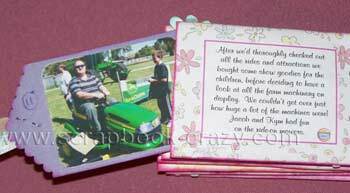 This little album, made in 2009, playfully depicts and journals a wonderful day my husband and I enjoyed with our son, daughter-in-law and grandchildren in October 2008, when we went to a country show in Bordertown, South Australia. It's a treasured memory we keep to remind us of that special family day spent in a warm and beautiful part of our home state. I love the colour combinations that are possible using pinks,blues, greens, purples and yellows! I used various different brands of papers, ribbons and flowers from my stash. 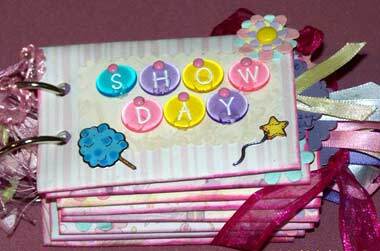 The rhinestones, pearls and rub-ons are from Kaisercraft. The title letters are alphabet 'buttons', and are held on by brads. For extra strength I also used some Pritt Gel to secure them onto the front cover. To add interest to the bazzill tags after cutting them out, I marked the top centre of each one and cut the two top edges with Creative Memories Scallop scissors, before stapling a piece of satin ribbon on each tag. I used ribbons of the same colours in the papers. After covering each toilet roll with a selection of papers I inked all edges with a bright pink stamp pad (brand and colour name unknown). The first tag in the album is handwritten (as I believe every album should have some of the author's handwriting in it! ), and the rest of the journalling is done in Murphy Script Viva font, 12pt, cut out using Creative Memories Antique scissors and adhered to the 'pockets'. 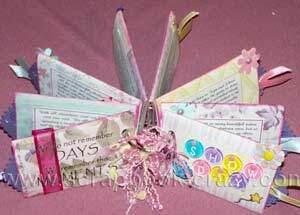 Each text box has a border in a colour that co-ordinates with the paper colour pallette. 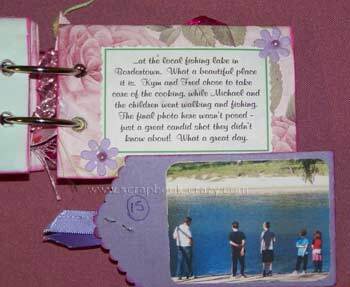 Every tag has a photo on each side, and the journal boxes on each side of the pocket tell the stories of the two photos in the pocket. 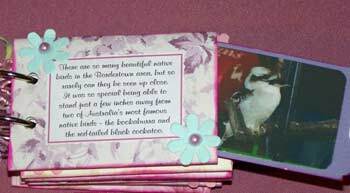 I used two large (1/5inch) hinged rings to secure the album, and ribbon and braid from my stash to decorate the rings. Cut the tags only slightly smaller than the inside of the pockets - too small and the tags will fall out easily! Secure embellishments with an aggressive adhesive for long-life. I love and recommend Pritt Gel, as it grips and holds forever. Knot ribbon/braid on either side of the ring hinges; this should keep the hinges at the back of the album when turning the pages.